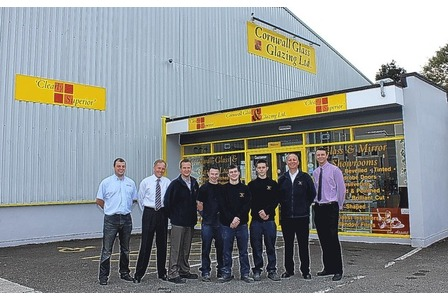 Cornwall Glass and Glazing Ltd has taken on six apprentices since June – triple the number it initially intended to recruit. The St Austell-based glazer and glass manufacturer, which has 12 outlets around the South West, employs 120 people and has a fleet of 40 vehicles. ​After approaching the National Apprenticeship Service for advice on recruiting Apprentices, Cornwall Glass and Glazing chose to work with South West Window Training, the glass and glazing division of GQA Approved Centre, PSC Training & Development Ltd, Plymouth. Mark Knight, HR and training manager at Cornwall Glass and Glazing, said: "We had originally planned on employing just a couple of young learners onto glass and glazing apprenticeships. However, since we started working with SWWT in June, we have now employed six apprentices and have also been able to gain funding to put members of our existing workforce onto the programme. "We now have over 20 members of staff all working towards industry recognised qualifications and it is likely in the future we will continue to employ more apprentices in our branches and centres across the region." Mike Blakeley, Business Development Manager for PSC Training said “Cornwall Glass and Glazing have shown a real commitment to the area in which they work by employing Apprentices.